Now that I am part of the Cozy Cat Press family, I thought it would be nice to introduce you to some of the other fabulous felines making their homes there. Today, you get to meet Blanche Manos. The Outside Lane: Blanche, how did you become a writer? Blanche Day Manos: I started writing when I was a youngster, inspired by Nancy Drew and by not having any friends nearby to play with. I created my own world with my words. As a child and later as an adult, I started writing poetry for children. I also wrote short articles on the importance of reading to children, books as a good baby shower gift, and my experience as an elementary school teacher. I wrote fiction for children and was published by several children’s magazines, including Cricket, Humpty Dumpty, Turtle, Guide, The Friend, Wee Wisdom, and others. I’ve also been published by confession magazines and Christian periodicals. I’ve written on assignment for many years for a Christian publication. TOL: Tell us about THE CEMETERY CLUB. 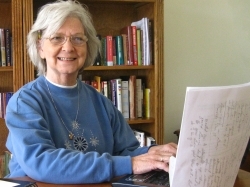 BDM: Several years ago, a friend introduced me to Barbara Burgess, another northwest Arkansas writer. Since we are both of Cherokee heritage and have heard several legends about northeast Oklahoma and northwest Arkansas, we thought it might be fun to write a mystery incorporating our ideas and experiences and so, our first book, The Cemetery Club was born. BDM: And how did you come to Cozy Cat Press? A: A funny thing…when we finished our second book, Grave Shift, and queried Patricia Rockwell, she was interested in it but thought it might have a little too much violence for a cozy. We re-wrote and she liked it and took it for Cozy Cat Press. TOL: Tell us about Darcy and Flora, the main characters of your series. BDM: The main characters in our books are quite a bit like Barbara and me; our likes, our beliefs, and the closeness we shared with our parents. We like Darcy and Flora, our main characters and we like their small and fictional town of Levi, Oklahoma. TOL: What’s next for your intrepid problem solvers? BDM: We are finishing our third Darcy/Flora book and I am thinking of maybe branching out on my own with a completely different series and a different protagonist. The second book in your series, GRAVE SHIFT, is getting rave reviews on Amazon. What is it about? When Darcy Campbell returned to her home town of Levi, Oklahoma, she longed for peace and healing from the recent loss of her husband. She found much more than she bargained for when two rare Oklahoma earthquakes, a villain with murder in his heart, and a mountain lion threaten her and her mother Flora Tucker. Being an investigative reporter on leave of absence from her Dallas newspaper, Darcy has an active curiosity which leads her into some dangerous places and nearly costs her her life. At last she solves a long-standing mystery in Levi and her grief begins to heal when the sheriff of Ventris County re-kindles an old flame in her heart. TOL: I can’t wait to read your books! Where else can we find you? 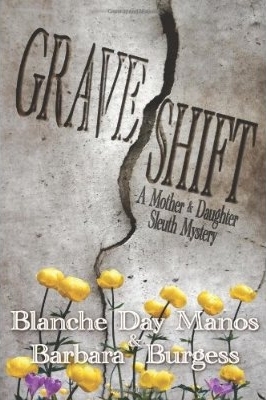 BDM: My website is www.BlancheDayManos.com, on Facebook, and on Google+ as Blanche Manos. Of course you can find all of Blanche and Barbara’s books on Amazon. Stay tuned for more Cozy Cat Press authors, and go visit Blanche’s website. She has a great blog tucked in over there. Next Post Sara Bareilles, Katy Perry, and Selling Out.